These Traditional precast concrete flower planters add beauty to your environment quickly and easily by placing green plants into your setting. Plants and flowers create a soothing environment for your residents, visitors and employees while adding to the richness of your landscape design. These concrete flower planters are perfect for walkways, building perimeters or entranceways. Place a flower planter on each side of your front doors on a stable surface to greet your guests into your establishment with a warm welcome. Available in a smooth stained concrete finish or a weatherstone concrete finish. 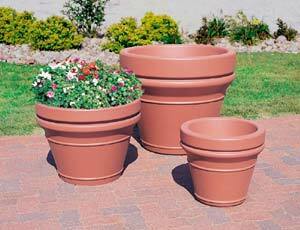 The concrete Planters are available in the colors shown below.